Nearly seventy-five years after World War II, a contentious debate lingers over whether Franklin Delano Roosevelt turned his back on the Jews of Hitler's Europe. Defenders claim that FDR saved millions of potential victims by defeating Nazi Germany. Others revile him as morally indifferent and indict him for keeping America's gates closed to Jewish refugees and failing to bomb Auschwitz's gas chambers. In an extensive examination of this impassioned debate, Richard Breitman and Allan J. Lichtman find that the president was neither savior nor bystander. 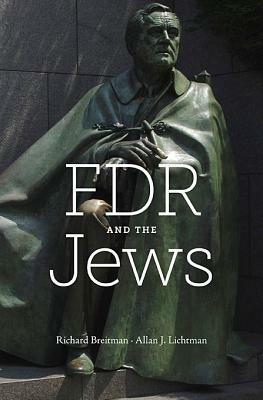 In "FDR and the Jews," they draw upon many new primary sources to offer an intriguing portrait of a consummate politician-compassionate but also pragmatic-struggling with opposing priorities under perilous conditions. For most of his presidency Roosevelt indeed did little to aid the imperiled Jews of Europe. He put domestic policy priorities ahead of helping Jews and deferred to others' fears of an anti-Semitic backlash. Yet he also acted decisively at times to rescue Jews, often withstanding contrary pressures from his advisers and the American public. Even Jewish citizens who petitioned the president could not agree on how best to aid their co-religionists abroad. Though his actions may seem inadequate in retrospect, the authors bring to light a concerned leader whose efforts on behalf of Jews were far greater than those of any other world figure. His moral position was tempered by the political realities of depression and war, a conflict all too familiar to American politicians in the twenty-first century.